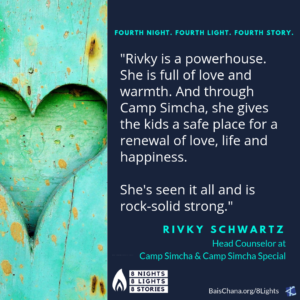 The hardest part about Rivky Schwartz’s job as head counselor of the girls division at Camp Simcha and Camp Simcha Special is watching children suffer. And there’s nothing like seeing a parent in pain for their child. But the privilege of bringing happiness to children who’ve been stripped of their childhood and thrown into a world far beyond their years is immensely rewarding. 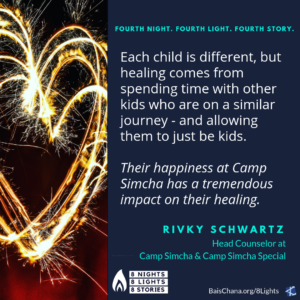 Camp Simcha is for kids with cancer and Camp Simcha Special is for kids with chronic illnesses. Although the camps are different, each child is given the same unconditional love and support. It’s been almost 20 years, and Rivky keeps coming back. One day, the “Simon Says Man” came to camp. Sally,* who was born without arms, walked over to Kayla,* who was born without legs and said, “I’ll be your legs if you be my arms.” And they proceeded to play the game together, as one. “Each child is a hero. The way they care about one another. They have strength. They are fighters. They move forward.” Sometimes they’re so heroic, you can forget that they’re kids. They may look small and they may be young, but their capability and ability to teach and change everyone around them has a ripple effect, because eventually it changes the whole world for the better. 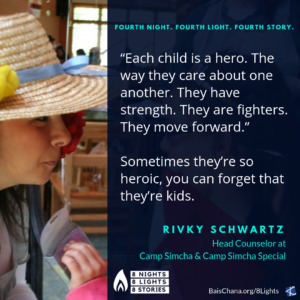 Many children who come to Camp Simcha are in the beginning stages of their cancer, some having just begun treatment. When Sophia* came to Camp Simcha, she knew she would start losing her hair soon. Each child is different, but healing comes from spending time with other kids who are on a similar journey – and allowing them to just be kids. 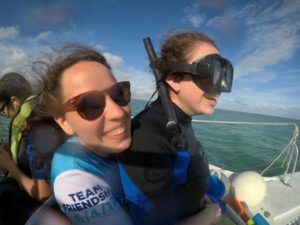 When Elena* was close to the end of her life, the Make a Wish Foundation offered her a wish. She could have asked for a day in Hawaii. She could have asked them to turn her basement into a music studio. She could have asked for a helicopter ride in the Bahamas. But Elena asked for one more day at Camp Simcha. The Make a Wish Foundation flew Rivky and Elena’s 2 counselors in, and together, they reenacted a day of Camp Simcha. 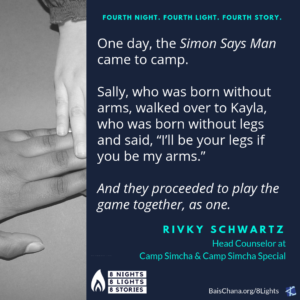 At the end of the day, when one of the staff members from Make a Wish was saying goodbye, she said, “When Elena asked for one more day at Camp Simcha, we did all the research we could possibly do about you guys, but I still couldn’t understand what this meant to her. Meet yesterday’s Light: Sarri Singer – Strength to Strength here. Meet all the remarkable lights here. *Names have been changed for privacy. If you're a Jewish woman of any age, we're the crash course on the soul of Judaism that you've been looking for. We're the adult Jewish summer camp you missed out on. We're your deep dive into Judaism. It's time to find out more, isn't it? Tell us what you'd like to see in your inbox and presto, it's there! Bais Chana Women International is a Chabad nonprofit organization that serves an international clientele of Jewish women from all walks of life, from teenagers to grandmothers, with Jewish education, guidance and support. 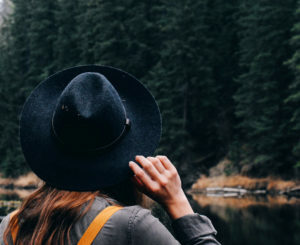 Bais Chana Women International retreats include Jewish UnCamp, Snorkel & Study, Women's Jewish Study Retreat in Lake Arrowhead, Women's Summer Jewish Study Retreat in Minnesota, Retreats for Women Fifty-Five-Plus, and Single Jewish Moms Connect. Visit www.greatnonprofits.org to read independent reviews of Bais Chana Women International written by alumnae, staff, volunteers and donors. BCWI is a 501(c)(3) nonprofit.